Attitude Adjustment: What Are Your Measurements? 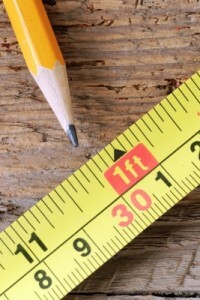 If someone were to ask you about your measurements, how would you answer? After all, depending on your health and fitness goals, you are measuring different things than the person running near you on the trail or lifting weights on a gym bench nearby. If your goal is weight loss or weight maintenance, you’re probably looking at the scale and using the tape measure to see how many inches you’ve lost. You may even be weighing your food and monitoring your calories. You’re counting the minutes of cardio and number of reps you’ve completed for any given workout. If you’re training for an event, you’re probably doing much of the above but you’re also you’re tracking a variety of times – splits, total distance, personal records. We all have a measurement mindset because it is one of the few ways to track our progress; to let not only ourselves, but those around us, know how well we’re doing. But on those days when the numbers are not what we wanted, what then? For many of us, it can mean falling into negative self-talk, or falling into old, unhealthy habits as a way to cope. Track how much additional weight you’re able to lift over the course of a month instead of how much you’ve lost or gained. Track how many miles you’ve walked or run instead of worrying about your pant size. Log how many steps you’ve taken over a week instead of how many minutes you logged on any of the machines at the gym. Count how many new fruits and vegetables you’ve integrated into your week instead of counting calories. Now, this is not to say that you should throw your training approach out completely, but once in a while, switch it up so that you can recharge your resolve. I think these are all great ideas. In the end, we need to focus on the effort we put in and how we feel about it, versus the outcome we anticipate. .-= Emmie´s last blog ..Walk From Obesity =-. .-= Caitlin (the quest for fitness)´s last blog ..Pat Summitt and Dementia =-. Emmie – Yes, focusing too much on the anticipated outcome can be detrimental when there are so many milestones (large and small) to celebrate along the way. Thank you for commenting. @Caitlin – The scale and the number can have such a stranglehold that it almost makes people go backwards, doesn’t it? Not a fan of a scale – but do see why it’s necessary sometimes (a physician at a physical or a fitness pro tracking results). There are so many other ways to set goals that can be met with a big smile. Thanks for stopping by and commenting. Good post. I love the Nike+ app for letting me select a variety of running goals and not assuming everyone is after the same thing. I had a terrible session with a trainer once who after putting me through the standard let’s see where you are fitness test, told me the plan was salad for lunch, soup for dinner so I could lose weight. At the time I was training for a marathon and all of seven pounds above the low end of my ideal weight. Weight loss was the farthest thing for my mind and even when he asked, he didn’t bother to listen to what goals I was interested in measuring. I have never taken a hate to someone so quickly. Next post: If You Were A Yoga Pose, What Would It Be?